The University of Leeds says its Annual Sustainability Report reveals “many success stories” achieved during the past 12 months. Leeds has linked its approach and commitments to the United Nations’ Sustainable Development Goals, “demonstrating how we can all play our part in a global solution”. Vice-Chancellor, Sir Alan Langlands, said: “The University has once again proved its commitment to a sustainable future through a whole series of activities, innovations, research and policies. There have been some challenges – political uncertainties and a growing campus – but sustainability has remained a key priority for us throughout. The report has also been independently verified by the National Union of Students (NUS), which stated: “The University should be commended on an impressive overall achievement. 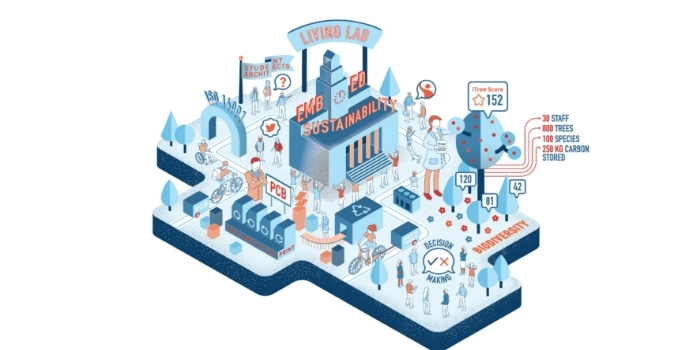 “The institution is showing valuable leadership for the higher education sector through initiatives like its student sustainability research summit, the Living Labs programme and the Student Sustainability Architects roles, all of which are novel and impactful in terms education for sustainable development.”As well as focusing on the Living Lab programme, the University plans to strengthen its commitment to the circular economy approach by revitalising the Reuse@Leeds system, which aims to get the best value out of surplus resources on campus. The University says it is also looking to develop an approach to engaging staff in sustainability, including a full review of the Green Impact programme, which brings together staff and students to play an active role in making the workplace more sustainable. The Positive Impact Partners programme will “continue to grow”, seeing staff working with more local Third Sector organisations, and the sustainability team is looking to develop the School Governors Programme to help school leadership teams set targets, policies and standards, and plan for future development.